Voice and video are the most difficult services to provision correctly, as workers require a high-quality, real-time experience. Anything short of that can remove many of the ROI benefits the company was hoping to realize. Companies deploying Skype for Business should choose the best possible voice and/or video partner to simplify deployments and optimize user experience. 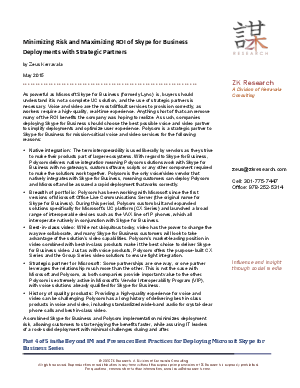 This brief outlines the importance of working with a strategic partner, and the top 5 reasons Polycom should be considered. A combined Skype for Business and Polycom implementation minimizes deployment risk, allowing customers to start enjoying the benefits faster, while assuring IT leaders of a rock-solid deployment with minimal challenges during and after.